Ride with GPS distinguishes between routes and rides. A ride is a recording of an activity from a GPS unit or mobile app. A route is a plan for a future ride. 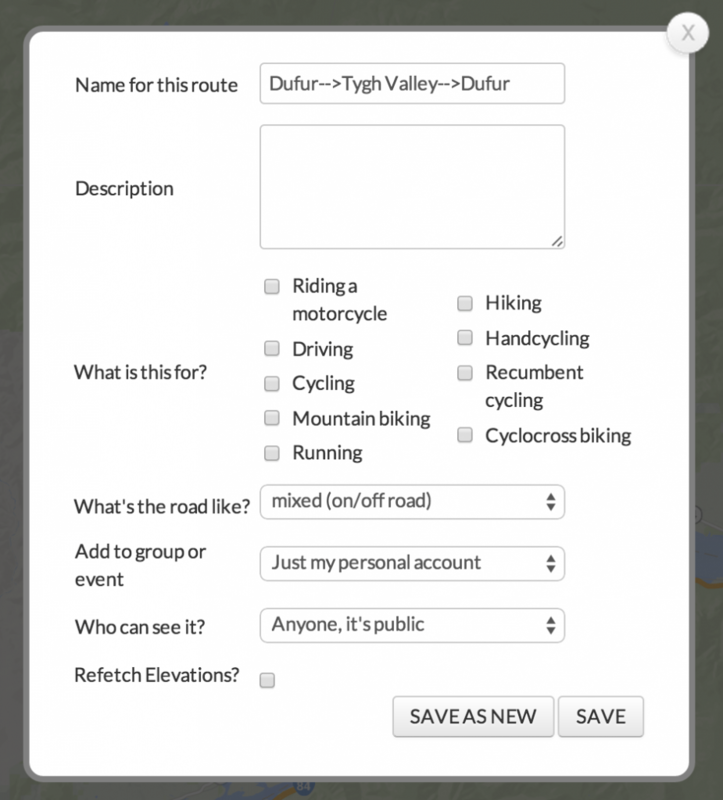 When you create a route using the Ride with Route planner, you can automatically generate a cuesheet for your route. Routes that you upload from another source, or that you create by copying a ride to your route library will not have cuesheets. Using our tracing feature you can take one of your rides, or a route with no cuesheet, and use it as a template to generate a complete route with a cuesheet and copies of the photos you took along the way. Your original ride will remain unchanged, the new route is a copy of the original with the added bonus of turn by turn directions. The Prepare for Tracing feature is part of our Premium subscriptions. 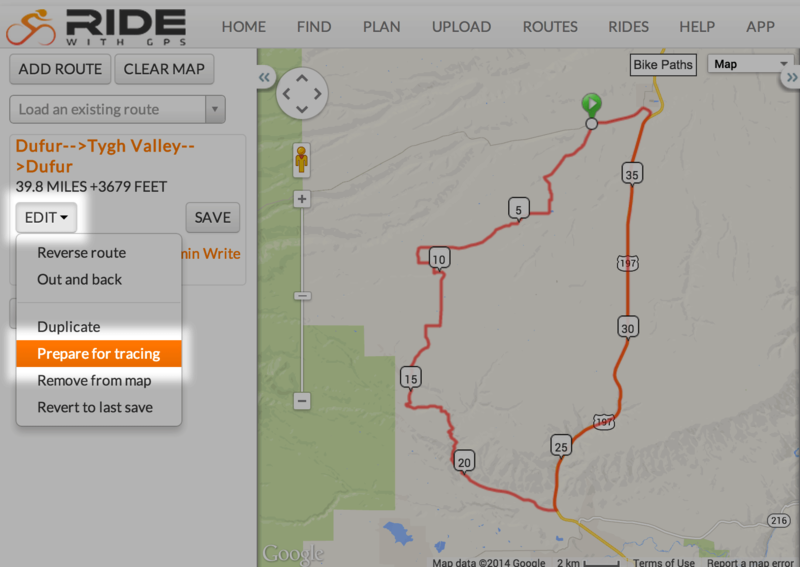 While viewing any ride or route on the website, look in the right side panel, scroll down and select COPY TO MY ROUTES. 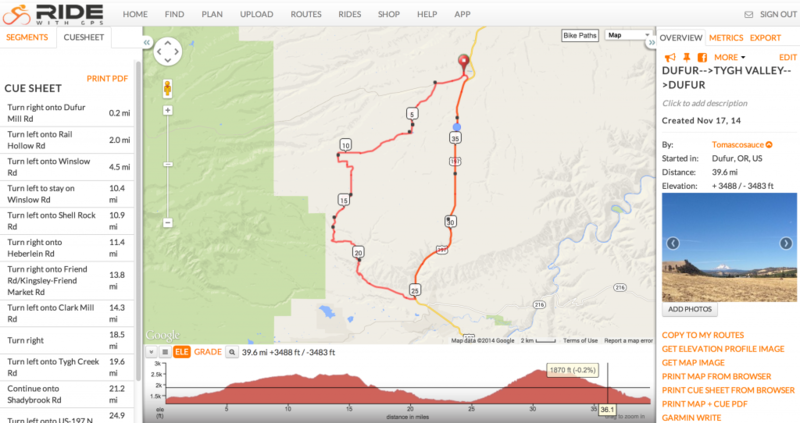 After clicking copy, you will be given the option to copy the route with our without photos (if the ride has photos associated with it). To keep the photos, make sure to click COPY WITH PHOTOS. This will create a copy of your route that you will be able to edit, while preserving the original ride for your records. 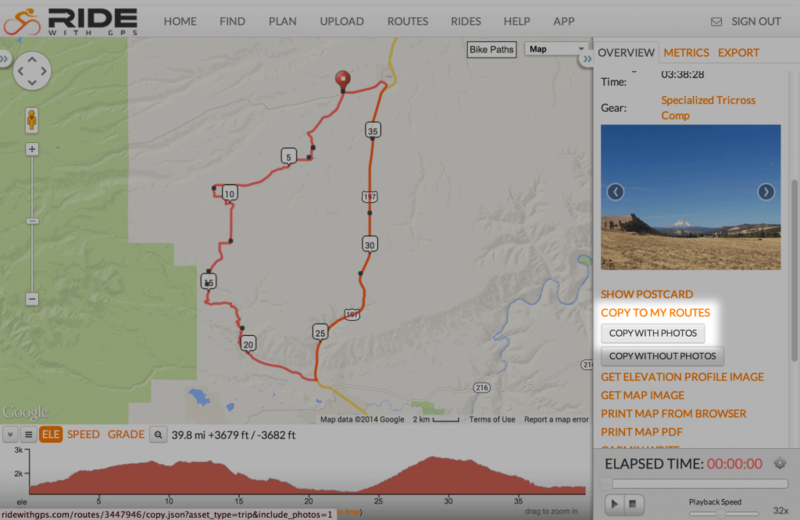 After copying the route with photos, you will see the option to either view or edit your copy. Click the edit link, which should open up a new page. On the edit page, like the route planner, there is a panel to the left and right of the map. On the left side panel, click EDIT, and then select PREPARE FOR TRACING from the options that appear. You will see the red path on the map switch to a gray color. The grey line is a reference, showing the path of your ride. Click along the gray route path to generate your cuesheet. You can trace the grey path exactly as is, or you can use only part of it. You can also start your route from a different location, including the path as a part of your total route. Make sure you have the “generate cuesheet while planning” option enabled, or your traced route will not have cues. To check this, click the OPTIONS tab at the top of the column to the right of the route map. Now the fun part! Trace the route by clicking along the grey path. Be careful to avoid clicking on intersections, as this can cause oddities on the cuesheet. Click after any intersection; our routing services are fairly smart and will know where you intend to go. Make sure to check your cue sheet! For more detailed route planning help read our route planner help article. After you’ve traced the entire route. Click SAVE at the top of the left side panel. A pop-up will prompt you to update the name, description, and other details for the route and click SAVEto preserve the photos and original route. After it has been saved, a pop-up will appear alerting you your route has been saved. Click VIEW YOUR ROUTE to check it out. Congrats, you now have a complete route with a cue sheet and copies of any photos from your original ride. Remember, your ride was not changed during this process, so everything remains attached to your profile and part of your profile mileage totals.